The posters look a tad bit similar to each other, do they not? 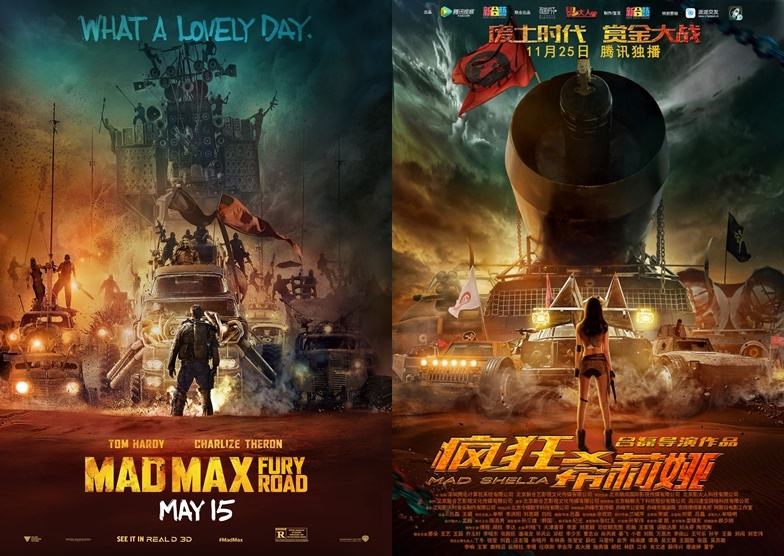 George Miller’s jaw dropping action flick, “Mad Max Fury Road” now has its Chinese counterpart by the name of “Mad Shelia”. Causing a buzz on social media, “Mad Shelia’s” trailer seems to be a scene by scene remake of the 2015 Hollywood film. But from the looks of the trailer - in terms of its quality and production pieces - it can be deduced that the movie had been made with half the budget of its Hollywood counterpart which got some netizens to brand it as ‘Mad Max: Made in China’. Even the movie’s name is said to be of poor proof reading skills as it is supposedly should be ‘Sheila’, an Australian slang for ‘women’. This is not the only time a movie rip-off has caused a buzz on social media as recently a Russian version of Marvel’s “Guardians of Galaxy” called “Guardians” also received the same reaction. Mad Max was first released in 1979 as an Australian post-apocalyptic dystopian action film directed by George Miller with Mel Gibson in the lead. In 2015, a new take on the original film titled “Mad Max Fury Road” was released which stars Hollywood A-lister Tom Hardy as Max Rockatansky and Charlize Theron as Imperator Furiosa. Click here to watch the "Mad Shelia" trailer.